The animation above shows how Direct Servo works to reproduce the most accurate bass possible. A sensing coil (blue) adjacent to the driver voice coil (red) is used to generate a feedback signal which is then used to correct any difference between the original and the reproduction. The sensing coil acts as a microphone, and the feedback is sent to the servo board where the necessary corrections are made instantly. The plate amplifier receives a signal which is filtered on the pre-amp board to achieve correct integration. The signal from the preamp passes to the power amplifier which then sends the amplified signal to the voice coil of the driver. The amplified signal is shown above in red. As the amplified signal passes through the voice coil, the cone moves and begins to reproduce the signal. At the same time as the cone is moving in response to the amplified signal, the sensing coil is generating a feedback signal. There is no time delay between step 2 and 3 because they occur simultaneously. While the cone is moving, the sensing coil is sending feedback. 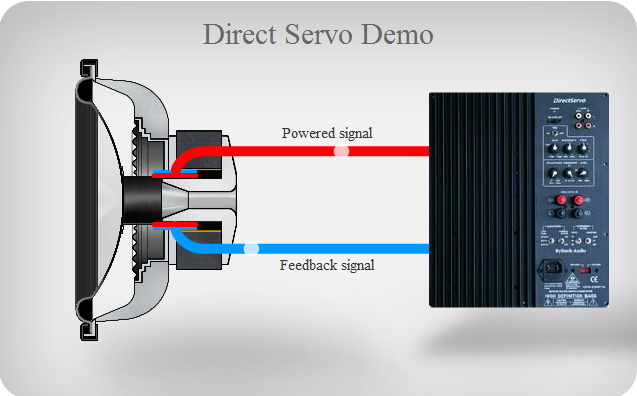 The sensing coil is a specialized microphone which measures the precise output of the driver. The correction signal is shown above in blue.